Our email lead generation software turns cold contacts into warm B2B leads. 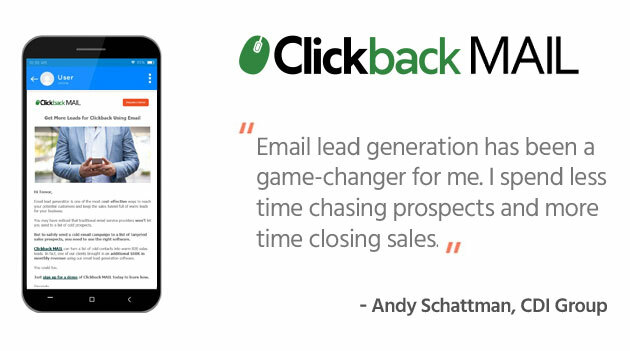 Clickback MAIL is email lead generation software, and it’s different from traditional marketing automation and email service providers. How? It lets you send 100% CAN-SPAM (US Anti-Spam Law) compliant email campaigns to your cold or purchased B2B contacts. Clickback MAIL also filters out detected Canadian and European emails to ensure your campaigns remain CASL (Canada Anti-Spam Law) and GDPR (EU Privacy law) compliant. Put your cold email list to work and start landing high-quality B2B leads by sending effective marketing campaigns to your targeted list of contacts. (View Our Case Study). Your list goes through a variety of health and anti-spam risk checks for improved deliverability. Choose from a variety of professionally designed templates, or use our drag-and-drop editor. Create personalized campaigns by adding in elements such as your contact’s name, company name, etc. Pull tailored reports to easily view and analyze key data – such as opens and click-through rates. You can’t scale your B2B business without a healthy dose of new leads entering the sales funnel. With the right approach, an outbound email marketing campaign can keep your brand top-of-mind with your customers and lead to more deals being closed. To put it simply, outbound email marketing is one of the most practical and cost-effective ways to bring prospects into your lead funnel. Unlike list services that just clean and validate your email database, Clickback MAIL also lets you build and send 100% CAN-SPAM, CASL and GDPR compliant email campaigns within the software. The easy message creator lets you design professional emails that not only look great, but get opened. Use the drag and drop editor to build powerful messages, and preview your content on desktop and mobile screens. The design and feel of your email campaign can have a big impact on its success. A well-crafted email message that also looks beautiful can highlight the professionalism of your brand, and leave a lasting impression on your audience. Whether your marketing team prefers to edit code from a pre-existing template or create brand new designs from scratch, the advanced HTML email editor gives them the freedom they need to create powerful emails. Our email lead generation software includes a unique spam checker tool that runs your content through a number of anti-spam risk checks in real time. It alerts you of any potential words, links or formatting that could negatively affect deliverability. Quickly pull tailored reports to easily view and analyze key data about your campaigns such as opens and click-through rates. By understanding how your unique content affects each variable, you’re able to optimize your content for maximum effectiveness. Our email campaign reporting tool provides you with the information you need to create the type of content that engages with your target audience. This way, you can continually improve your campaign ROI. Our email lead generation software offers a proven way to send effective outbound email marketing campaigns. The advanced deliverability features of Clickback MAIL allow marketing and sales teams to reach a targeted audience of industry-related cold contacts. When it comes to sending emails to a non-permission-based list, reaching the inbox can be a challenge. That’s why Clickback MAIL includes advanced list cleaning features that remove spam traps and bad email addresses. The software uses its own IP’s to protect your business’ sender reputation. After you import your purchased list into our software, every email address goes through a variety of health and anti-spam checks. These hygiene checks will reveal if an email address is a spam trap or could cause issues with spam filters. This significantly improves the bounce rate of your email campaigns and helps get your message to the inbox. The advanced spam checker tool runs the content of your campaign through a series of advanced filters that alert you of any potential deliverability threats before you hit send. The software will only let you send 100% CAN-SPAM, CASL, and GDPR compliant email campaigns, so you can be sure that your messages are delivered safely, and above the law. The personalization features include tokens for user and company names. This is a key factor involved when looking to increase the user engagement of an outbound email marketing campaign. Schedule a demo of our proven email lead generation software today. Turn your cold list of contacts into warm B2B leads.